Ton Ton, a ramen spot from Guy Wong (Le Fat), will open at Ponce City Market. Ton Ton, Ponce City Market, 675 Ponce de Leon Ave. NE, Atlanta, GA 30308, no phone. Doug Turbush, chef/owner of Seed Kitchen & Bar and Stem Wine Bar in Marietta's Merchants Walk, will open Drift Fish House & Oyster Bar in February 2016 at The Avenue East Cobb. Drift will focus on wild-caught and sustainable seafood, according to Turbush. Atlanta-based firm ai3 designed the 5,260-square-foot space. Drift Fish House & Oyster Bar, The Avenue East Cobb, 4475 Roswell Rd., Marietta, GA 30062, 770-635-7641. 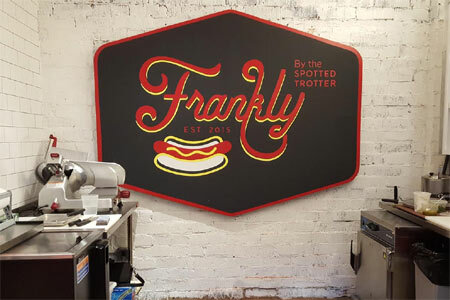 The Spotted Trotter owners Kevin Ouzts and his wife and business partner Megan launched Frankly in fall 2015 with a view toward selling themselves as well as sundry hot dog vendors in Atlanta the hot dogs they purvey. Attention to detail is everywhere, as this operation is a cut above the crowd. So the ketchup is Sir Kensington's and the chili is made in-house. Sausages also are on the menu, and none of the offerings break ten bucks. Frankly, Krog Street Market, 99 Krog St. NE, Atlanta, GA 30307, 470-428-2509. Justin Anthony of 10 Degrees South, Yebo and Cape Dutch has opened his long-awaited Biltong Bar. The menu offers South African pies filled with chicken curry, bobotie and vegetable curry, organic house-cured biltong (somewhat like beef jerky) and chicken potpie that we hope reminds us of Malaysian chicken pie. South African wines will be a focus, too. Lunch & Dinner daily. Biltong Bar, Ponce City Market, 675 Ponce de Leon Ave. NE, Atlanta, GA 30308, 678-515-0620. Roberto Leoci enjoyed a lengthy run as Savannah's Italian cuisine guru. But he is on the road to New York City, leaving behind his closed trattoria and having cut his ties to Pacci Italian Kitchen + Bar, the restaurant in redesigned The Brice hotel in the Historic District. Leoci had not only developed Savannahians understanding of authentic Italian cuisine through his two restaurants, he also had produced a line of fine Italian food products. Staff pretty much operated on their own anyway, so no one expects any misses in performance, although we think leadership will be needed to press forward with updates to menus and to keep Pacci at the top of its game. Pacci Italian Kitchen + Bar, The Brice, 601 E. Bay St., Savannah, GA 31401, 912-233-6002. On February 1, 2016, The Varsity management team closed the iconic restaurant's Alpharetta location. The Varsity continues to operate in its North Avenue spot, complete with service at parked vehicles. Other outposts still operating include Kennesaw, Gwinnett, Dawsonville and Hartsfield-Jackson Atlanta International Airport. In addition, there's a longtime The Varsity in Athens, Ga. The Varsity, 11556 Rainwater Dr., Alpharetta, GA 30004, no phone.